Ever seen those high gloss, smooth floors in commercial kitchens and wanted something similar? You’re looking at epoxy resin floors. The product is so popular that the global epoxy resin market is predicted to reach $11.22 bn by 2021. It’s hygienic, safe, and easy to care for. Why wouldn’t you want to install one? But you may not know how to apply epoxy resin to your own floor. That’s fine! That’s why you’re here. Read on and learn why and how to apply it properly on your commercial kitchen floor. 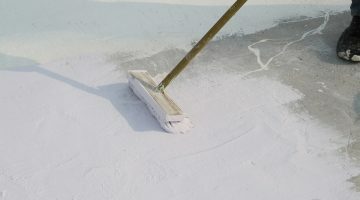 Why Should You Use Epoxy Resin? Concrete floors aren’t very pretty to look at. While a ‘pretty’ floor isn’t essential in a commercial kitchen, a safe one is. Coating your floor with epoxy resin stops dirt building up in cracks in the concrete. It’s easy to clean these floors. 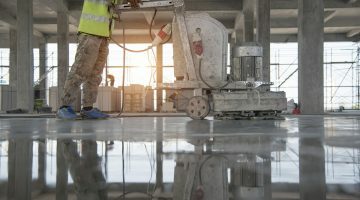 Epoxy resin works best on concrete flooring, where it’s more long-lasting and easier to maintain than a regular floor coating. Epoxy resin floors last between two and five years before you need to reapply. Using epoxy resin also gives floors a level surface and a seamless finish. Bacteria can’t hide and multiply in the cracks. That creates a safe working environment for your staff and helps give your customers peace of mind. Epoxy resin isn’t the best name for it. It’s actually made up of resin and a hardener. Combining them together sets off a chemical reaction that causes them to form a hard surface. This new material bonds with the flooring beneath. Start by sweeping and then vacuum the floor. You don’t want any dust spoiling the finish. Repair cracks or chips to the concrete and make sure there are no oil or grease spots. They can stop the epoxy resin binding with the floor. You can use clear epoxy coating to prime the floor before your main application. Or use a dedicated primer like RFC Epoxy Damp Proof Membrane to prevent water ingress from below. Mix the resin and hardener in a large container. We recommend you use a paddle attached to a drill to be really thorough. You can pour it straight onto the floor and use a roller to spread it around. Or pour it from the mixing container into a roller tray. And then roll it onto the floor. Start rolling immediately. You only have around half an hour before it starts to harden. For larger areas, have two or more people applying the coating. 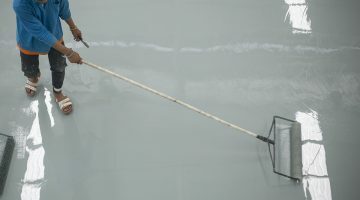 One person can use a brush to apply the coating by the walls. The other can use a roller. 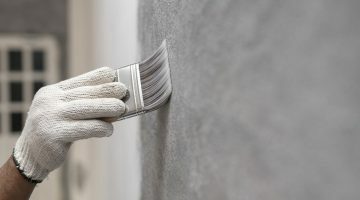 To get an even coat, roll the coating vertically onto the floor. Then pass the roller over the coating horizontally without applying any more product. It helps you avoid bubbles too. After a minimum of twelve hours, you can apply a second coat. Epoxy resin cures faster in well-ventilated spaces. Follow the manufacturer’s instructions to the letter. Don’t apply it if the space is outside the application temperatures stated. When Will You Install Yours? Now you know how to apply epoxy resin to your commercial kitchen floor. It’s easy to install and even easier to care for. Epoxy resin also makes your kitchen safer for your staff and your customers. All while lasting for years so you can get on with doing what you do best. 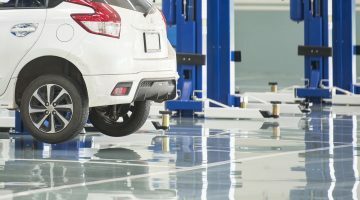 Want to install an epoxy resin floor yourself? Read our guide to the questions you should ask before you hire a flooring contractor.